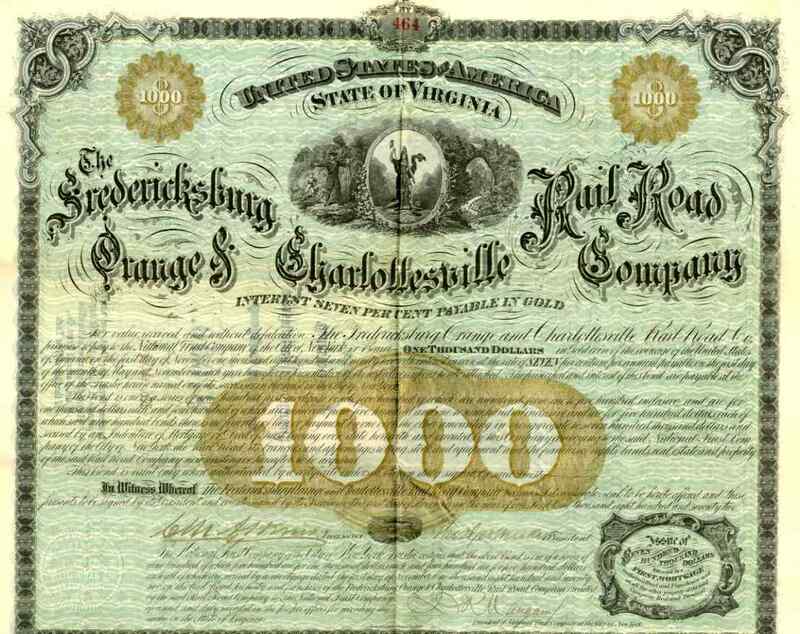 1872 Fredericksburg Orange & Charlottesville RR Bond Certificate. Scarce impressive Virginia railroad scripophily bond with interesting vignette of surveyor and Natural Bridge behind state seal. The Fredericksburg Orange and Charlottesville Railroad was incorporated by the Virginia General Assembly in February 1872. It had a short life. It purchased the Fredericksburg & Gordonsville Railroad, with the stipulation it would complete its line to Orange by July 1873, which did not happen. The Fredericksburg Orange and Charlottesville failed shortly thereafter. The property reverted to the Fredericksburg & Gordonsville RR, which was renamed the Potomac Fredericksburg & Piedmont Railroad in 1876. This bond is in VF+ condition.